After losing his job, Lee Kravitz, a workaholic in his midfifties, took stock of his life and realized just how disconnected he had become from the people who mattered most to him. He committed an entire year to reconnecting with them and making amends. Kravitz takes readers on ten transformational journeys, among them repaying a thirty-year-old debt, making a long-overdue condolence call, finding an abandoned relative, and fulfilling a forgotten promise. Along the way, we meet a cast of wonderful characters and travel the globe to a refugee camp in Kenya, a monastery in California, the desert of southern Iran, a Little League game in upstate New York, and a bar in Kravitz's native Cleveland. In each instance, the act of reaching out opens new paths for both personal and spiritual growth. All of us have unfinished business the things we should have done but just let slip. Kravitz's story reveals that the things we've avoided are exactly those that have the power to transform, enrich, enlarge, and even complete us. The lesson of the book is one applicable to us all: Be mindful of what is most important, and act on it. The rewards will be immediate and lasting. Lee Kravitz was Editor-in-Chief of "PARADE," the Sunday newspaper magazine, from 2000-2007. Before that he was the Founding Editor of "REACT," a magazine for teens, and served as an Editorial Director of Scholastic Inc. As a journalist, Kravitz has traveled on assignment to dozens of countries. His mission as a writer and editor has been "to tell stories that connect emotionally to everyday Americans, moving them to actions that improve their lives, nation and world." Kravitz is president of Youth Communication, a publisher of writing by and for inner-city teens and youth in foster care. He is also active on the boards of the Public Education Network and The League: Powered by Learning to Give. A graduate of Yale College and the Columbia University Journalism School, he lives in New York City and Clinton Corners, New York, with his wife and three children. Why does the author embark on his year-long project? What does he hope to accomplish by tying up his life’s loose ends? The author lists several reasons why he lets important matters slide: not enough time or energy, his tendency to procrastinate, his fear of doing the wrong thing. What are some of the reasons that you accumulate unfinished business? The author writes that his family is the source of his “most intimate and anxiety-producing” unfinished business. Do you think that's true for most people? Is it true for you? The author goes on ten journeys to close circles or make amends. Which of his journeys -- for example, paying back a debt, finding a long-lost relative, thanking an old teacher -- resonated most with you? Why? If you had one year to tie up your loose emotional ends, how would you spend it? 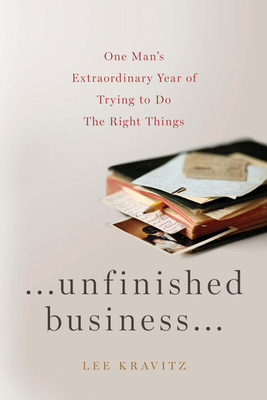 What items would be at the top of your list of unfinished business? Shahid believes that it's important to address your unfinished business because "we need to make an accounting of these things before we die, so that our souls can rest." Akmal says, "It's not about resting in peace. It's about moving forward. It's about optimizing your human potential." Who in your opinion is right? Think of all the people you cared about who have passed away. Did any of them die without knowing what they had meant to you? If you had one more conversation with those people, what would you say to them? The author says that he wants to live "a more connected life?" What does he mean by that phrase? Rate your own life. On a scale of 1 to 10, how rich is it in terms of human connectedness? Mr. Jarvis challenges his students by saying: "After you die, what would you like people to say about you? Your answer to that question should guide the way you live." What would you like people to say about you after you die? Has this book given you a perspective on your life that you find useful? What ideas are you likely to take away or apply from it? Can you think of any steps you can take in your own life to keep yourself from accumulating unfinished business?